The hardy ligustrum genus is a versatile group of shrubs for accents, hedges, or small trees. 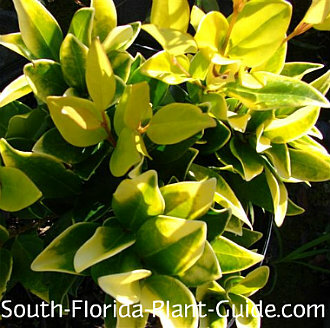 Three of the most popular for South Florida landscapes are varieties in green, gold-tipped and variegated. All have an attractive outward growth pattern and dense foliage that makes them ideal for camouflage and privacy. Ligustrum japonicum is the green variety (sometimes referred to as "privet" or "Japanese Privet"). It can be used as a shrub for "privet hedges" but it's far superior in the form of a tree. This plant can grow 15 feet or more with a nice, natural shape. 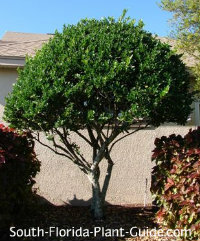 You can also keep it sheared into a smaller "bonsai" form of about 8 to 10 feet. A naturally multi-trunk tree with deep green, shiny leaves and white spring flowers, the all-green shrub is one the most popular choices for an easy-care small yard tree. When kept manicured, it's outstanding in formal landscapes or Oriental gardens. Left to grow naturally, it works well as a small shade tree with a casual look for any landscaping style. As specimen trees, these trees look their best with a low groundcover planted around the base. You might also grow them in rows on each side of a walkway to form a beautiful canopy. You can buy a green ligustrum already trained as a standard - or plant a small shrub and trim it yourself into a multi-trunk tree. Ligustrum japonicum 'Howardii' is a gold-tipped beauty that looks like the all-green variety dressed up to go to a party. Its bright yellow new growth tops older green leaves for a bit of landscape bling. 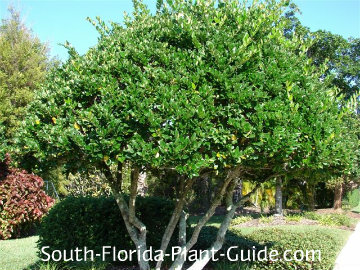 This shrub is most often used as a hedge and seems to be gaining more and more popularity with homeowners and commercial properties as well. If using either of these two ligustrums - green or gold - as hedge plants, trim the top slightly narrower than the base to let enough light through so that the bottom of the plant doesn't grow bare. 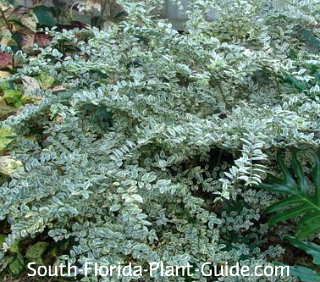 Sometimes called "Chinese Privet," sinensis (Ligustrum sinense 'Variegatum') is so heavily variegated with white on the leaves it looks like a cloud in the landscape. It blooms with small white flowers in spring for a striking white-on-white appearance. The foliage is smaller than the other cultivars and its fine texture and soft coloration make it a very attractive accent plant against other greenery in the home landscape. Sinensis doesn't grow as large as the other two cultivars; instead it grows very wide in a more rounded, weepy form. Sometimes parts of this plant will revert to green leaves rather than variegated. You can cut out the green or leave it for an unusual look. These are evergreen, fast-growers that prefer full to part sun. Sinensis can be trimmed to 3 or 4 feet, the others to 4 to 6 feet (or more, if you prefer). They're cold-tolerant and can handle anything winter dishes out, so they'll do fine anywhere in South Florida. The white spring flowers are pretty though short-lived and not pleasingly fragrant. Ligustrums are said to be deer-resistant plants, though nothing is deer-proof. Add top soil (or organic peat moss) and composted cow manure to the hole when you plant. 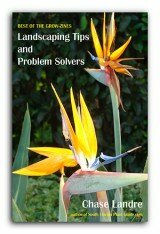 Trim lightly to shape anytime and do a hard pruning in spring after the bloom cycle is finished. Sinensis looks best left in a more natural form, while the green or gold-tipped varieties do fine manicured with hedge trimmers - or not. Drought-tolerant once established, these shrubs do best with water on a regular basis, allowing time between waterings for the plant to dry out a bit. Overwatering is the most common affliction for these shrubs. Be sure the planting area is well-drained and doesn't stay wet and mucky too long after a hard rain. For hedge shrubs, place them 3 or 4 feet apart. Come out from the house 3 feet or more. As a tree-form, situate the plant 5 or 6 feet away from anything fairly large...and come out from the house 8 feet if you can. 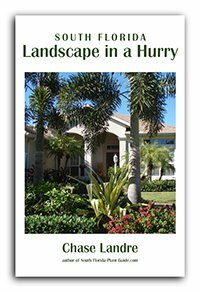 To situate plants along a walk or drive, come in 4 feet or more. This plant will do fine in a very large container, though at some point it will outgrow the pot. COMPANION PLANT SUGGESTIONS: Oleander, jatropha, hibiscus, dwarf fakahatchee grass, copper plant, bush daisy, and coral creeper.